Here's a structure claiming to be the oldest on the planet. And it technically does leave Wyoming's Dinosaur Bone Cabin in the fossil dust. It's built of "wood turned to stone." 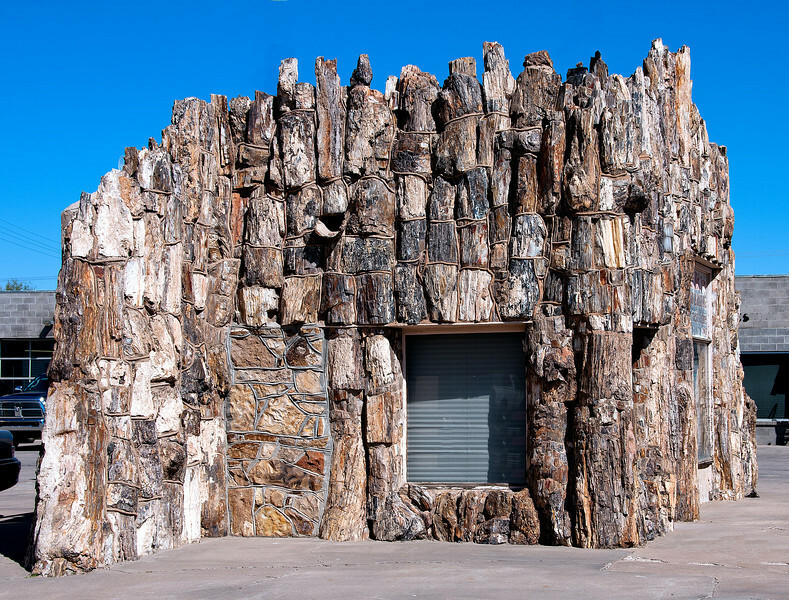 Lamar's Petrified Wood building started out as a gas station, built by lumber dealer W.G. Brown in 1932. The building walls and floors are constructed of large pieces of petrified wood over 175 million years old. In 1962, the service station became Lamar Tire Service. As of April 2010 it is on the grounds of a used car lot and appears to either be vacant or used for storage. On Main St. just as you enter from the north intersection of routes US 50 and US 287.